Due to the numerous competing fashion week events The Gallery LA founder Mikey Koffman decided to change things up for the LA Fashion Weekend Fall/Winter presentations. Instead of three days of runway shows Mikey opted for one fashion showcase and the launch of the first ever LA Fashion Awards show. If you think about it, Los Angeles is home to the Grammys and the Oscars, so why not a Fashion Awards show? Mikey helped start the original LA Fashion Week over 10 years ago, so it makes sense that she would be the one to make a Fashion Awards ceremony happen. The invite read “Cocktail Attire Required,” so most everyone was dressed for the red carpet whether they posed on it or not. Bubba Sweets made a special Green Eggs and Ham cupcake in honor of St. Patty’s day. It was comprised of a maple cake and maple frosting topped with caramelized bacon and a fondant egg. Also available was the Willy Wonka (Hersey chocolate chip cake with chocolate cream cheese frosting) and a Baileys Irish Cream. I have to give Erieka Pimentel credit – she really comes up with some inventive creations. Before the show started we were treated to a performance by the lovely Ms. Kimberly Caldwell. Kimberly was the seventh place finalist on the second season of American Idol and after hearing her sing she should have been the winner! This gal is amazing. Check out her debut album Without Regret on iTunes. I was fortunate to be seated next to the charming Mr. Lemar L. Joichin III founder of American Gentleman magazine. I see him at all the LA Fashion Weekend events, so it was nice to have the opportunity to chat with him. The goal of American Gentleman magazine is to redefine what it means to be a gentleman in today’s world by focusing on modern trends and considerations while adhering to traditional notions of chivalry and class as guiding principles. Lemar is a big believer in treating others with respect and giving back to the community. The main focus of the ceremony was to honor those that were involved with the 2012 LA Fashion Weekend events. However, Mikey also wanted to acknowledge those who had stood by her over the years and helped make LA Fashion Weekend a success. Mikey presented the Founder Award, with the aid of Kimberly Caldwell, to Sunset Gower Studios for their ongoing support of LA Fashion Weekend. Kimberly is a born natural on stage and she was the prefect co-host for Mikey. They both had a great chemistry and were very amusing. Other recipients included Wella Professionals (Title Sponsorship and Artistry Team Award), Napoleon Perdis (Beauty Sponsorship and Artistry Team Award), Nobu Hotel (Lounge Sponsorship and Activation Award), LA Fashion Magazine (Media Partnership Award), and Planet Salon (Fashion Achievement Award). The Lifetime Achievement Award went to Public Counsel for their work with low income individuals, non-profits, veterans, immigrants, and children’s rights. Public Counsel is an organization that is near and dear to Mikey’s heart and she is very supportive of their work - so much so that she hosts a benefit fashion show for them every October. She got a little choked up when presenting the award because what they do hits close to home with her. Mikey had a tough childhood and her grandpa was also a veteran that was treated poorly by the system, so she truly is grateful for their work. The next performance of the evening was by pop-rock artist Sabrina Antoinette, who is signed to Chris Brown’s CBE label. For the second half of the event various celebrities announced the awards. Peggy Tanous of Bravo’s Real Housewives O.C. presented the Women’s Couture Award, which went to Dina Dina Bar-El. Peggy just happened to be wearing one of Dina’s creations. Rocco Leo Gaglioti (Fashion News Live and E! Celebrity Style Story) handed the Men’s Couture Award to Anthony Franco. 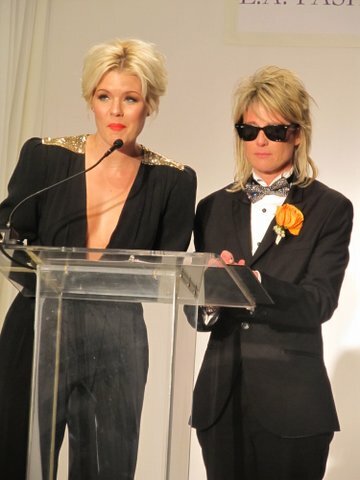 The handsome duo—Alan McCune and Enrique Godoy Ynzenga—behind Skinny Executives presented The Contemporary Designer Award to Betsey Johnson and accepted on the label’s behalf. Sabrina Antoinette gave the award for Resort Wear to Culture Swimwear, and Kimberly Caldwell bestowed the final award of the evening for Emerging Designer to Flynn Skye. The night concluded with another energetic performance by Sabrina Antoinette. You can download her debut single “I Know You’re Out There” on iTunes. Overall, it was an entertaining event and everything went smoothly. Those that received the awards and a majority of the attendees have a great deal of respect for Mikey. You really have to give her credit. Despite her rough beginnings she worked hard to make her dreams a reality and become the successful person that she is today. She truly is an inspiration. (To find out more click here to read our interview with Mikey). Mikey Koffman hopes that one day the LA Fashion Weekend Fashion Awards will evolve into a black-tie sit down dinner, much like the Oscars, and given her track record with making LA Fashion Weekend a success it won’t be long before we’re all seated at tables watching her host the grand gala.